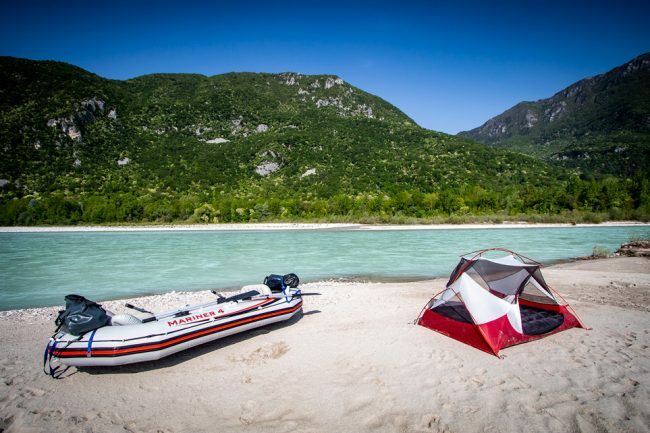 The Tagliamento is the last wild stream in Europe, the 178 km long river in the north-east of Italy flowing from the Alps to the Adriatic Sea, close to Venice. Often mentioned as “the king of alpine rivers” and is considered as one of the last unregulated and intact rivers in the Alps and Europe. 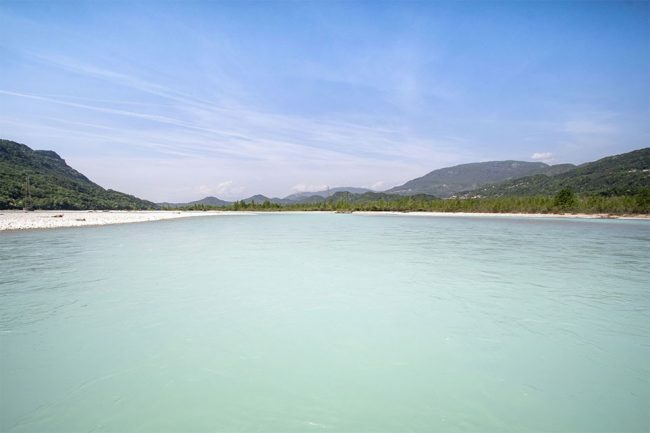 Except for its channeled part from Latisana to Lignano Sabbiadoro, the Tagliamento still flows as nature has created. No dams, no artificial river bed just a couple of bridges and power lines are “polluting” this stream. 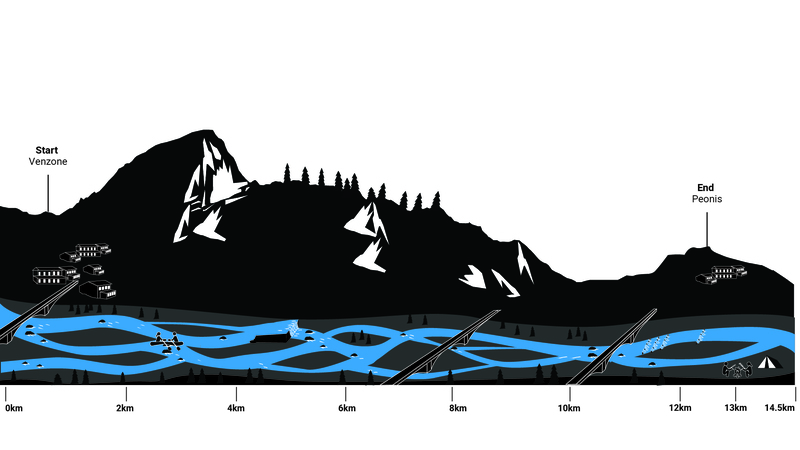 Its heart is the up to two kilometers wide network of primary and side arms, islands, forests, ponds and boulder fields. 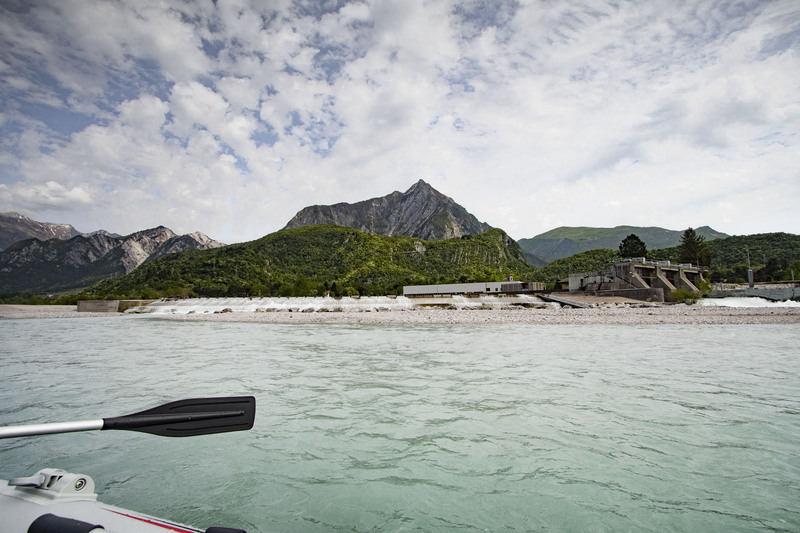 A few hundred years ago, most of the Alpine rivers still looked like the Tagliamento. The most significant challenge is not the water temperature or facing the rapids, but to find the right amount of water to be passable. The flow rate can be variable from 90m³/sec up to 4500m³/sec. 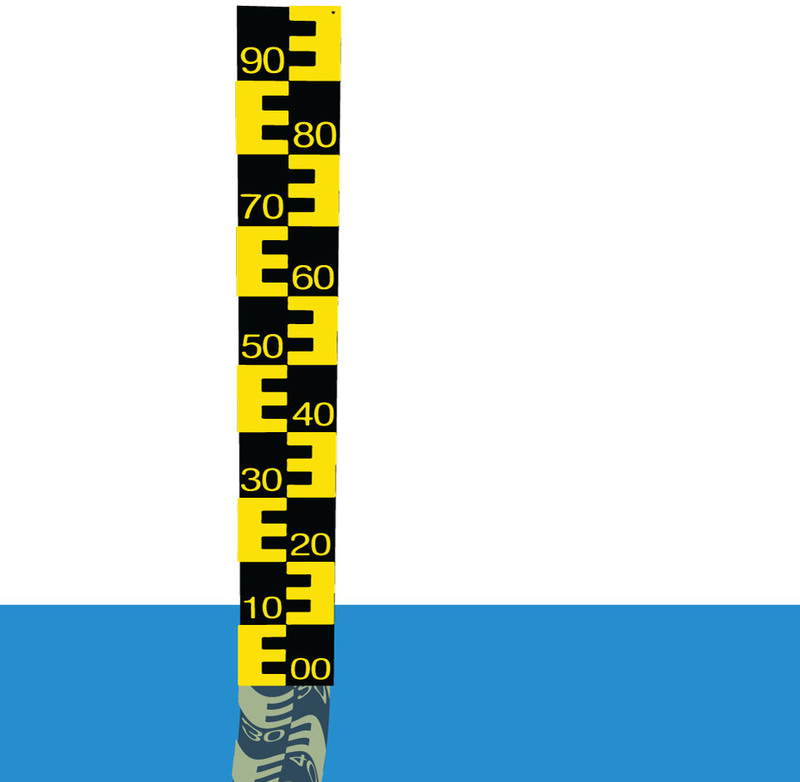 During summertime, there is barely any water left which will make a boat trip impossible. There are two main time windows: one in spring from March until May and the other one during late autumn. But still, you will need to check the water levels. From Latisana the stream is passable the whole year, but it is also less attractive due to the channelization. We arrived in Venzone at 9.00pm by train, due to the lack of sunlight we decided to book a hotel close to the river. Unfortunately, we didn’t realize that the hotel is 4km from the train station, which would have been an impossible journey with our 70kg of luggage –even with our beloved folding cart. After a short walk to our entry point of the Tagliamento, where we hid most of our stuff in the bushes, we continued our journey to the hotel. We followed the SS13 4km north to our accommodation. On our way, we passed a small village which was almost completely wiped in 1976 by an earthquake. Just lid by our passing headlights the ruins looked sketchy. The village Venzone was nearly leveled to the ground during the earthquake but thanks to international and national aid rebuilt to its ancient medieval splendor. After a short night, we bought the missing supplies in a corner store in the middle of Venzone. What would be a boat trip without some authentic Chardonnay from Italy? We would still recommend buying most of the stuff in a more prominent supermarket because the choice isn’t that big in this small village. Still a bit nervous because of the adventure lying in front of us we reached our starting point. Days before our adventure we improved our boat by adding an extra pair of oarlocks to our raft. So both of us were capable of rowing at the same time, to avoid dangerous situations: an adjustment that would become more than necessary during the trip. Turn right at the train station, after 200 meter you will reach a small trail, follow this trail to the left until it turns left again. Here, you have to leave the trail and turn right. Until you reach the Tagliamento. There is a small shop and a bank at the main square of Venzone close to the cathedral. An hour later our raft was inflated and packed to begin our journey. Right at the start, a couple of kayaks were passing by with an enormous speed. 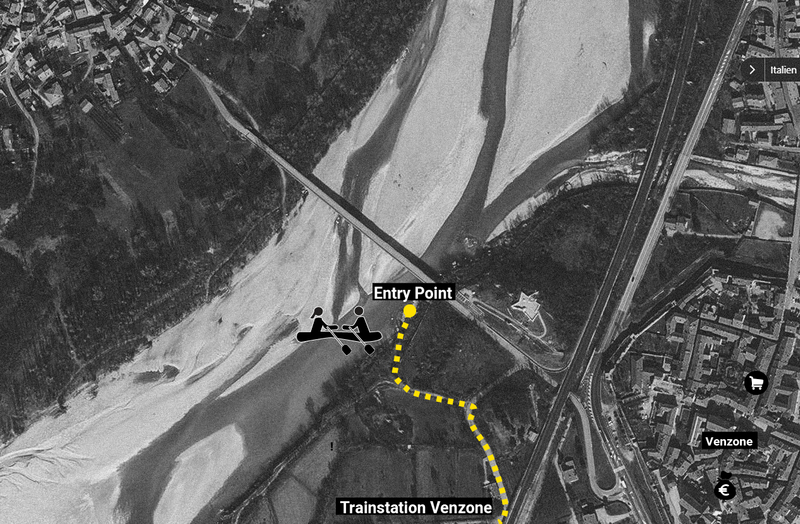 The Tagliamento can reach a speed up to 15km/h close to Venzone. The Kayaker wore drysuits, lifejackets, and helmets, we on the other side looked like tourists ready to holiday on the beach. 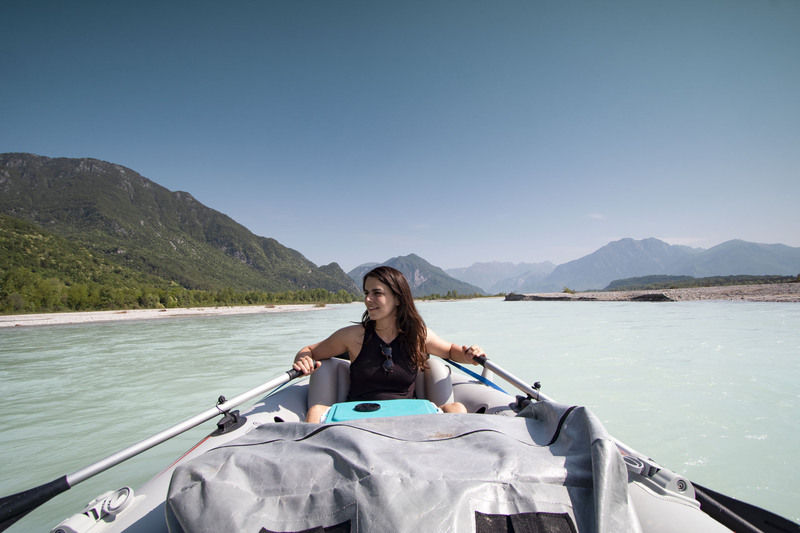 The scenery was terrific; the turquoise glacier water was glistening in the late morning sun; the river was framed by the 1505m high Monte San Simeone on the right side and by the 1958m Monte Plauris on the left side. From a distance, the boulder fields flanking the Tagliamento looked like Caribbean beaches. 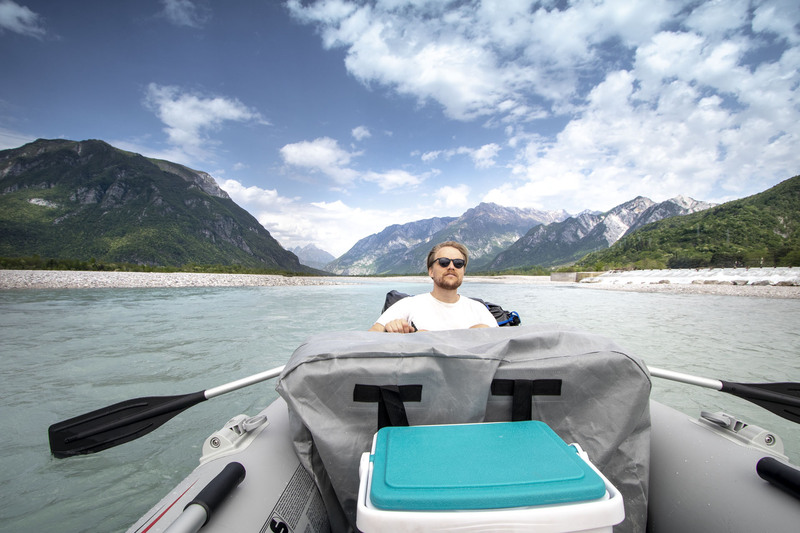 The kilometers were rushing by, unlike our last trips on the Danube we had to adjust our course constantly: to avoid obstacles in the river and sometimes just for fun or a better view towards the Julian Pre Alps. We reached Ospedaletto after just 4km. 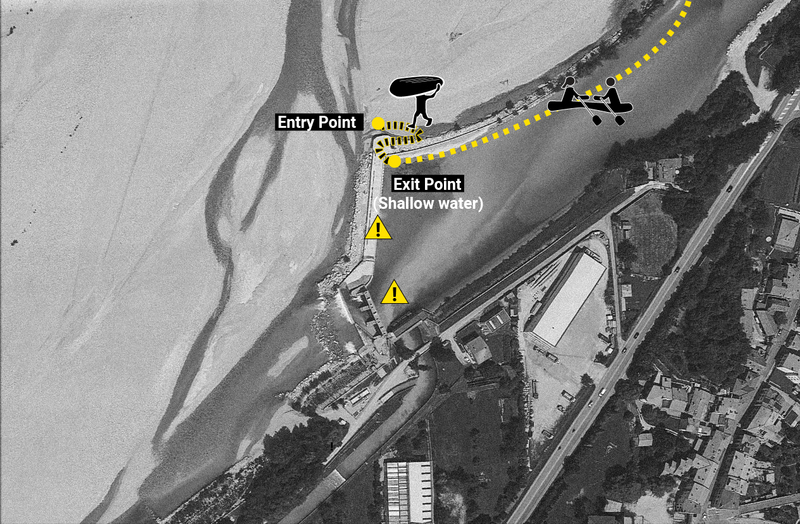 During high tide, you can try to paddle around the half-way dam at the right side; otherwise, land at the right corner of the dam (shallow water). The kayakers who passed by earlier were already resting at the end of the portage, which meant a welcome break for us. 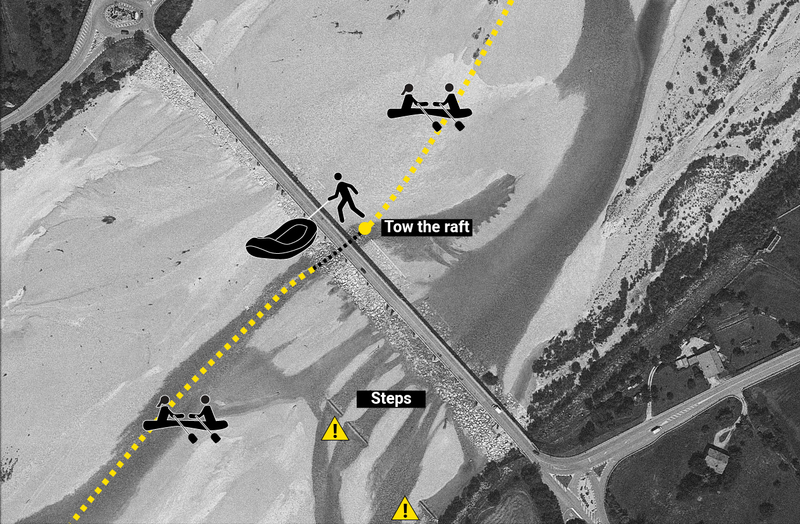 Be careful when entering the Tagliamento, there is a strong current after the weir. We unloaded our luggage and rested for half an hour on the concrete dam while waiting for the other paddlers to continue with their journey (this way making room for us to move our boat down the dam). We lifted our 35kg (77 pounds) raft over the artificial stone barrier, which was easier said than done. Repacked the whole boat and continued floating. From here we could already see the Ponte di Braulins: a vast bridge connecting the villages Braulins and Pineta. We landed on a small island in the middle of the stream to inspect the situation. Some Italian watched us curiously from the bridge and were filming the somewhat complicated situation with their iPads. Maybe they are not used to rubber rafts on the river or our “holiday” rafting style was a bit too inadequate, and they were expecting some disaster. Without proper water shoes, it is no joy to walk in the river bed, Bella was better equipped than I was. I realized I had to use my sneakers as water shoes for the rest of this adventure. The mainstream of the Tagliamento looked towable between the middle posts of the bridge. 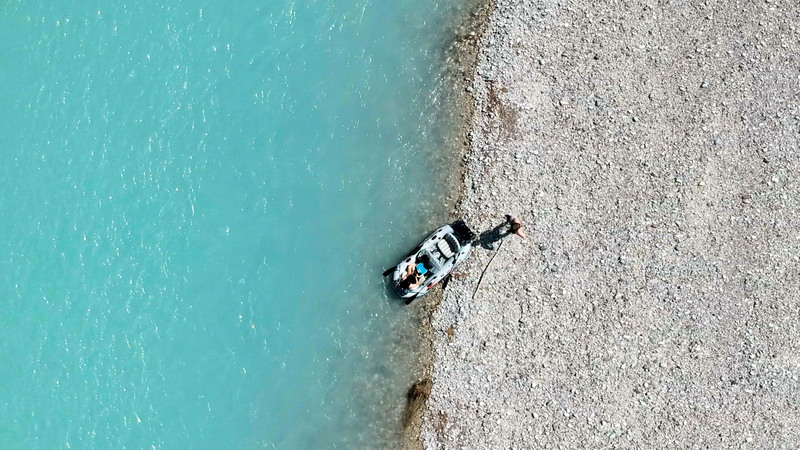 So we took our boat for a walk… an enormous joy for me… it quickly became one of my favorite activities on the entire journey. Professor Tick Tack (how my nieces christened our raft) was a perfect towing partner. (Don’t forget a good tow and learn how to make a bow knot). 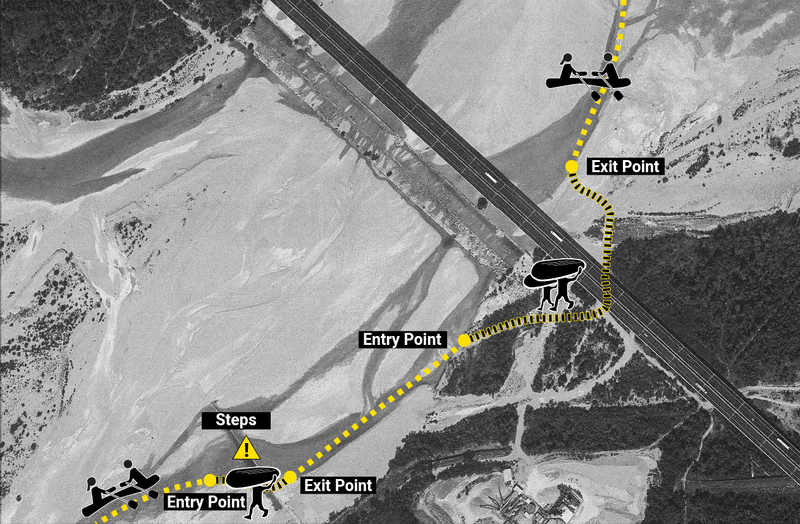 From here it’s 2km to the next obstacle, the Motorway bridge, and the connecting weir. Thanks to the perfect tour description by Steve we already knew that we had to unload our luggage and carry it around the bridge. Our kayak friends arrived just a couple of minutes before we reached the bridge. We took half of our bags and started searching for a good reentry point. Inspect the situation before you drive through the bridge. Bring a good tow and learn how to make a bow knot, we towed our raft through the middle pillars of the bridge. 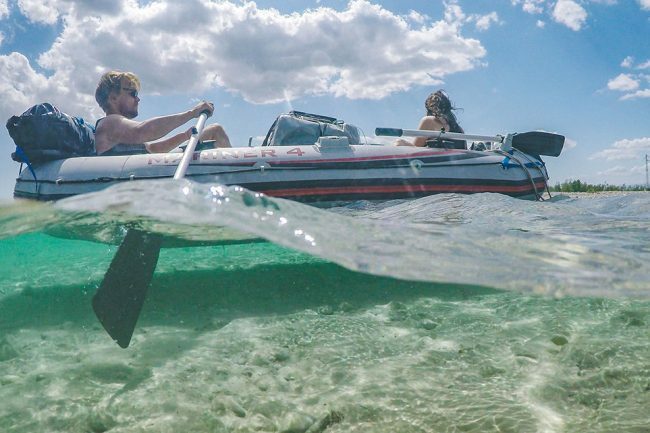 If you are a gentleman, let your girlfriend sit in the boat if the water is deep enough. Have fun and tow safe (I love towing). Now it was time to carry the boat, because of a previous injury Bella couldn’t lift the raft. So we placed an inflatable seat pad on my back and put the raft on top of it. Bella took the tow and guided me towards the reentry point. After nearly an hour, we finally carried the last bag around the bridge. Exhausted we fell into the sand and stared out into the distanced mountains. We could see the kayaks of our patrons dancing nervously in front of the step-fall a few hundred meters away. Due to the rapid speed of the Tagliamento, we reached the step in a couple of minutes. Bella was watching the others for a while and warned me about the problematic situation ahead. I underestimated the immense power of this river and my anticipatory rowing skills. I tried to reach the last stone of the artificial dam, but it was too late. We were floating closer and closer to the glittering abyss. Even a jump into the cold water couldn’t prevent the raft driving into the depth. Luckily Bella grabbed the railing in the last possible second. The raft raised vertically; the keel was scraping on the edge of the concrete step. Water flooded our boat, and I grabbed the end of the raft and went down too. You have to carry your raft or kayak. Unload your raft before the bridge. Before you start carrying your stuff, search for a good entry point. After 100 meters, there is another obstacle: three steps in the river. You can inspect the situation; we would recommend carrying your boat. 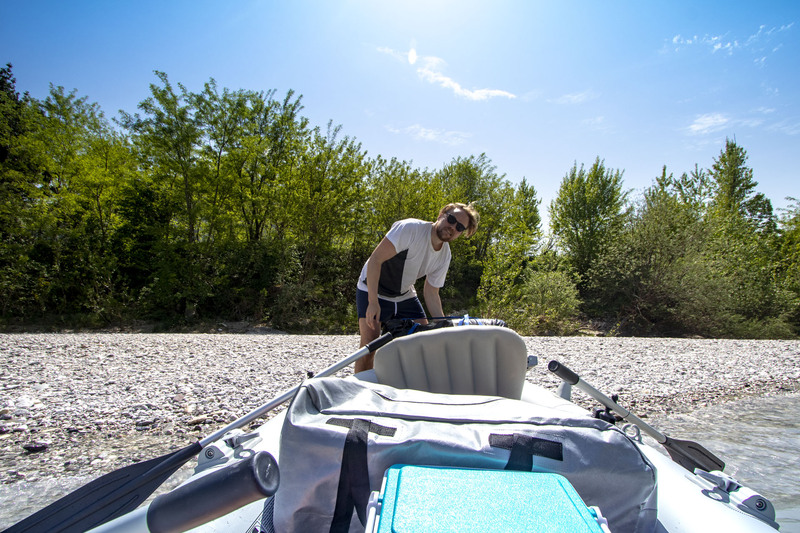 We followed the Tagliamento for a few kilometers, exhausted and happy we decided to search for a campsite. At the slope of the Monte Covria (1160m), we found an elevated spot for our tent. The sun was hiding behind a few clouds, and we started to pitch up our tent. We tried to warm ourselves including my wet sneakers at a campfire. A bottle of wine and a self-made hamburger were the rewards for this eventful day. After another bottle of wine, Bella realized that it might be too hot for my sneakers… and the sole was completly burned away….